If you love bacon – here are some great tips on how you can include it into your pantry storage and long-term storage solutions! You can have bacon even when the zombies come! My husband lives in a world where bacon is in everything. Me, not so much. So it was a struggle to always have bacon available for him to put in his creations, or to add to things I’d made, but needed bacony goodness. (I blame the bacon, it just doesn’t like me). So I did a little research and found some viable options for keeping bacon year-round without stocking my refrigerator full! Yes, in fact, you can! Here’s how I do it. Lay bacon strips out on a cooling rack and freeze single pieces in single layers (I use these trays and these racks from Amazon). This flash freezing method allows each individual slice to freeze on its own, reducing the chance of pieces sticking together and forming bacon bricks. My grandmother always just tossed the bags into her freezer, but it frustrated me to pull out just a few pieces. Store in airtight freezer safe containers. I happen to use freezer zip-top bags for short term storage (that I know we’ll be getting into in the next month or so) and vacuum sealed bags for long-term storage. Cook it to a little under your desired doneness. Dab off any excess grease. Flash freeze on cookie sheets. Throw into freezer safe, airtight containers. Toss into the microwave to finish off, or onto cookie sheets in the oven or even into a skillet (I let it warm up the bacon instead of throwing frozen bacon into a hot pan). Can I store bacon in the pantry? Can you really store bacon for long-term food storage? The answer is quite simple: yes you can! 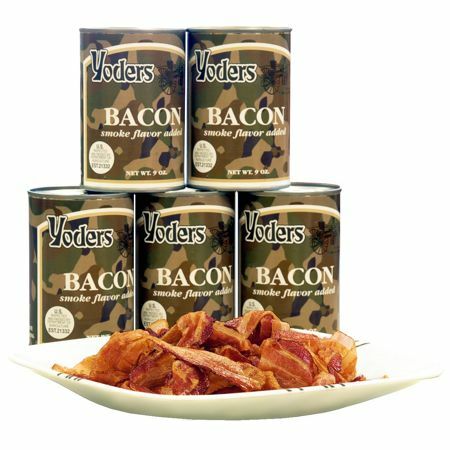 Here are the food storage options for bacon lovers. This is a way you can make shelf-stable bacon with a little preparation. This would be for some serious bacon devotion or if you received a pig portion, or if you just want to add another homesteading skill to your repertoire. You’ve probably seen the pre-cooked bacon in a box, sitting near your meat section. It’s quick, convenient, microwaves in a hot minute, and will sit on your shelf for quite a while. While the USDA recommends only storing until the “use by date”, we know that those dates don’t mean the food has expired, it’s just when the optimum quality may have been achieved. Bacon aficionados will turn their noses up at this kind of bacon because it’s just shaved bacon (can you get any thinner with those pieces), and has even more preservatives than regular store-bought bacon. But for emergencies, you can’t go wrong with being able to pull out a package and having it ready with little preparation. You’re probably familiar with the bacon crumbles available in the grocery store or other favorite online retailers. Bacon bits in a jar or resealable bag can be reopened numerous times (throw a silica pack in to help with moisture control after opening to help extend the shelf-life), and used to add some flavor to bland dishes. Just be aware – most bacon bits that you’re familiar with are actually bacon-flavored TVP – Texturized Vegetable Protein – a soy product. They’re actually vegetarian! They do add flavor you’re used to with the smokiness, but they aren’t real bacon bits. If you’re wanting to stay in the real meat world, know that those 100% real bacon bits are full of a lot of preservatives to cure, flavor and preserve for shelf-stable storage. It’s really a toss-up. But it’s bacon! Or at least tastes like bacon! These directions are for cured bacon only. Drain bacon (or pat dry with paper towels). Dry at 160F for 8 hours or so. Be sure to open your machine and pat the crumbles dry often to absorb any fat and moisture that accumulates. You might also want to lay parchment (baking paper) out on the bottom of your machine to protect it from any grease that may drip. *Dehydrating bacon for long-term storage is not an approved method of preservation for the home cook. Bacon contains fat, and no amount of cooking or dehydrating will get rid of all of the fat. Fat will go rancid fairly quickly, so you want to do this knowing that it is not a food you can store long, and it will need to be stored in your refrigerator or freezer for the safest storage. So, if you are really desperate for keeping bacon on your shelf for hard times (you know when the snowstorm hits and you’ve gone through your bacon stash in the first three hours … or those zombies, take your pick), there is commercially canned bacon that can save your bacon! I have no experience with this bacon (though I’m sure someone on Youtube has). I’m offering it up as a viable option if you’re really wanting to make sure to have bacon on the shelf all the time. Home canning is not an approved way to preserve bacon according to the National Center for Home Food Preservation. However, if you decide that, after much research, you want to learn to do it, Backwoods Home Magazine teaches you how. There are also quite a few Youtube videos by folks who do it and you can watch the process. Linda from Linda’s Pantry walks you through the process on one of her videos. If you’re one of those folks who has invested in a freeze-drying system, like the Harvest Right Freeze Dryer, to help build your food storage, then lucky for you – you can actually freeze dry cooked bacon! Are you one who likes to know they always have bacon on the shelf, no matter what? Which one is your favorite means of bacon for long-term food storage?